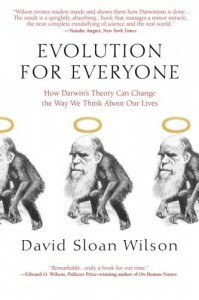 In An Idiot’s Guide to Evolution, First Things author Stephen Webb discusses David Sloan Wilson’s new book Evolution for Everyone (2007). The dirty Darwinian secret is now out of the closet: If evolution is true, then it must be true about everything. Creationists have long argued that Darwinists use their scientific theory as a cosmology, or “worldview,” which they deny to the hilt, while all the time using it that way. But I think that they do so just to distance themselves from social Darwinism. But Wilson’s book ends the farce, and admits that evolution is a way of thinking about everything that matters. Blech. 1. Why limit Darwinism to biology? By what logical/scientific rule? Most Darwinians used to be very restrained about the relevance of their theory for cultural and moral issues, for obvious reasons. If evolution is true about everything, then randomness and competition are the foundations for the highest human ideals as well as the lowest organic life forms. Scientists have trouble enough restricting Darwinism to biology. What if that restriction is unscientific? What parents would want their children being taught that Darwinism explains not only speciation but also altruism? The statement “The environment selects some beetles to eat their young” serves a function in biology similar to the function the statement “Nature is fallen” serves in theology. Both have explanatory power, but the biological statement tries to be descriptive, whereas the theological statement is clearly normative. Christianity teaches that nature is not what it God intended it to be, and thus nature alone cannot be a guide to moral behavior. Without that normative claim, however, Darwinian philosophers are left with an environment that selects any kind of behavior as long as it gives a species a competitive advantage. If we do not eat our young when resources are scarce, it is only because nature has selected other strategies for our survival. It follows that morality must be either a heroic but ultimately fruitless struggle against our nature or a rationalization and mystification of self-interested behavior. 3. Darwinian efforts at peace can only come by enforced pluralism – i.e. the destruction of pluralism’s dissenters. common it has been in the past.” He admits that a shared value system is a prerequisite for world harmony, but he thinks that “pluralism can be enshrined as a virtue and its suppression punished,” since “virtually any value system can be stabilized by rewards and punishments, as long as it is agreed upon by consensus.” If this leaves the reader thinking that Wilson embraces fascism as a way of enforcing pluralism in order to ensure world peace, he corrects this impression by arguing for the power of art to take the place of religious values. 4. If Darwinism becomes ridiculous outside of biology, what makes us think that it is not ridiculous inside of biology? Perhaps Wilson’s ambition, which lies at the heart of Darwinism, has inadvertently demonstrated how empty evolution is. If it is this trivial when applied outside biology, why would we non-biologists imagine that it is deeper when it is restricted to biology? One cannot help but suspect that if evolutionary theory looks absurd, simplistic, and circular when applied to something as complex as religion, then it might look the same way when applied to biological organisms. If evolution is true about everything, then we are doomed to live in a world without truth, beauty, and goodness. If we are not doomed, then evolution is not true about everything. And if evolution is not true about everything, then there is good reason to think that it is not true about anything. Natural selection is the process by which favorable traits that are heritable become more common in successive generations of a population of reproducing organisms, and unfavorable traits that are heritable become less common. You have, yourself, professed to believe that such things take place. That’s all “Darwinism” is. It doesn’t say anything about the way we want things to do, or the way we think they ought to be. It’s just a theory of how reproductive organisms develop over time. What’s complicated about this? Why does it have to become an issue of sociology for you? No moral claims are being made by those of us who — like yourself — believe that natural selection (i.e. Darwinism) takes place. I have to agree with Stewart here. I don’t know what it means for Darwinism to be “true about everything”, but I would distinguish between the science of Darwinian evolution (which makes no normative claims at all) and the philosophy that folks like Richard Dawkins claimfollows from Darwinism. I’d say Dawkinism is bunk, but that’s a totally separate issue from the science of Darwinian evolution. Seeker, you need to separate the science itself from how it’s used. One can use nuclear energy for bombs or energy. Scientific theories themselves are morally neutral. believe that natural selection (i.e. Darwinism) takes place. Typical misunderstanding. Natural selection is NOT Darwinian evolution. For that to be true, the heritable traits have to be new information created by some mutation event. That’s the hopeful miracle of evolution. Natural selection might easily select for adaptive traits already present but somehow turned on or off in the genome, but selection of existing information is not evolultion. I would distinguish between the science of Darwinian evolution (which makes no normative claims at all) and the philosophy that folks like Richard Dawkins claim follows from Darwinism. I’d say Dawkinism is bunk, but that’s a totally separate issue from the science of Darwinian evolution. I agree with this somewhat, but there is an operating principle here that Darwinists ingore, which is that ideas and principles don’t exist in isolation – they exist within the web of reality, which is connected. To be surprised that social Darwinism arises out of Darwinian thought is to be almost purposely naive. It’s like saying that the proposed biological origins of homosexuality will not impact public policy on the matter. And valid scientific models often apply across scientific disciplines, so it is normal to take a model and apply it to other areas to see if it has explanatory power. Based on these ideas, which perhaps not everyone will accept (but which the book’s evolutionary author obviously does believe), I think that, as the reviewer notes, if evolution leads to such heinous or ridiculous conclusions outside of biology, I suspect that it may be incorrect within biology. That’s not a foregone conclusion, but I think that’s a valid way to think about rubrics. Various people have appealed to the theory of evolution to lend respectability to their appalling moral views…But this fact says very little about evolutionary theory itself. Virtually any morally neutral, or even morally good, doctrine can be misused for evil purposes. I understand this, but I think it is too blunt. While any idea can be abused, some ideas lead directly to such unethical or immoral conclusions without abuse or twisting of the ideas. And we are not talking about the abuse of a technology (e.g. nuclear engergy), we are talking about the application of a functional model to other areas of life. And the application of darwinism to human society is a small jump because both involve biological organisms. For the same reason that atheism leads inexorably to religious suppression and persecution (when given governmental power), Darwinism leads to social Darwinism without some other *valid* principle, like the sanctity of life (an idea that flows naturally from Christianity) halting its natural progression to abuse of humans. The argument for Social Darwinism doesn’t depend on biological Darwinism being true–if social evolution works by the same mechanism claimed by Charles Darwin then even if young earthers were right that wouldn’t count against social darwinism. Now if Darwin’s ideas had never existed then obviously they wouldn’t have been used to “justify” the oppressive laissez faire capitalism of the 19th century. But in my opinion it’s naive to think that savage capitalism’s supporters wouldn’t have come up with some other rationalization. Based on these ideas, which perhaps not everyone will accept, I think that, as the author notes, if evolution leads to such heinous or ridiculous conclusions outside of biology, I suspect that it may incorrect within biology. That’s not a foregone conclusion, but I think that’s a valid way to think about rubrics. I see no reason to imagine that the human tendency to apply a biological theory in stupid and heinous ways counts against the validity of the science. Adolf Eichmann compared the genocide of the to pruning a tree; that doesn’t justify the suspicion that the principles of gardening don’t apply to trees. I really think the author’s contention is silly. I don’t agree that atheism leads to religious suppression any more than religion leads to Inquisitions or Crusades. What would lead an atheist to suppress religion is the belief that religionists threaten to impose restrictions on the way they want to live, but that lacking God-belief doesn’t imply holding the “religionists are threats” opinion. This charge against atheism is exactly as unfounded as the claim that religious belief leads to oppression of non-believers. But what leads religionists to oppress non-believers in the idea that God wants them to force non-believers to believe. Religious believe doesn’t imply believing that God wants people to force worship on those who don’t believe. There’s way too much bad thinking on both sides of this debate. I don’t agree that atheism leads to religious suppression any more than religion leads to Inquisitions or Crusades. Again, I am saying that the former is a natural and inexorable conclusion of atheism, while the latter is an abuse of the Christian faith, not a logical outcome of the teachings of the faith. That’s the difference. I have explained previously why atheism leads to cruelty – this is a logical progression, not the abuse of atheism. This charge against atheism is exactly as unfounded as the claim that religious belief leads to oppression of non-believers. No it is not. Some faiths, like Islam lead inexorably to oppression due to their foundational teachings. It’s not whether an ideology is religious or not that determines if it leads to oppression, but what the logical extensions of their teachings into public policy create. I disagree. The assumption of its truth lends credence to the idea that we can help humanity progress through purifying the gene pool. If Darwinian evolution were assumed false, that would essentially remove the “scientific” appeal of social Darwinism, and relegate it to a much less believable state. Seeker, your posts are rife with special pleading for Christianity. It’s a fallacy and it’s quite blatant. As a “friend” of Seeker, I find myself in the unique position of having to agree with Cineaste. I will go on step further in saying that I see a pattern of excusing the flaws in a particular position because it supports Seeker’s views while at the same breath attacking other positions because of flaws of similar weight. It really is a double standard and shows in my eyes an inability to be as objective as possible while still conveying one’s beliefs and opinions. This inability to be “balanced” and be “special pleading” for Seeker’s take on conservatism and his brand of “Christianity” is on of the reasons I have been mostly silent the last few weeks as these posts have come in. One can’t reason with fanatic passion. I have already admitted to some level of special pleading for xianity. However, I stil hold that both atheism and Darwinism are faulty ideologies, and both logically, and without abuse, lead to or are linked consistently with the unwholesome results we’ve seen in history. Now, people who think I am calling them communists or nazi’s because they buy into either of these ideologies are just being childish – I’m doing no such thing, any more than I am calling all Muslims terrorists when I claim that Islam is an evil, violent, and demonic ideology. Each person must decide how much they identify with their pet ideology, and how much they follow it faithfully to it’s logical extremes. If you claim allegiance to one of these ideologies, what I am really saying is that you are mistaken, not evil. However, if you pursue that ideology seriously, you will become evil because they are rooted in untruth that leads to cruelty. Now, Darwinism may be less pathogenic than atheism or Islam, but that doesn’t make it true. The whole point of this article, however, was to address the claim by the EVOLUTIONIST author that evolution should be used as a framework to understand more than just biology. The reviewer said that when we do so, we get unsavory results, and therefore, perhaps we should also doubt its voracity with respect to biology. And I have consistently made that point here – and it’s a valid one, imo. The same “unsavory results” have existed long before Darwin. Two Thousand years ago there was a Greek City State called Sparta. The Spartans practiced infanticide by throwing unhealthy babies off a cliff. The first test came early. A ravine a few miles outside the centre of Sparta was known as the Apothetae – the ‘Deposits’. It was also called the ‘place of rejection’, because newly born Spartan boys were thrown into the ravine if they were judged unfit to live. Infanticide was common throughout ancient Greece. Unwanted babies – usually girls – were left on hillsides. Sometimes they would be placed in a basket or protective pot so that there was at least a chance of someone coming along and taking the child in. In Sparta, things were, as ever, different. Boys rather than girls were the likeliest candidates for infanticide. The decision about whether the child lived or died was not left to the parents but was taken by the city elders. And there was no possibility of a kindly shepherd rescuing a newborn child after it had been ‘placed’ down here. The decision of the city elders was final, terminal and absolute. The abandonment of sick, puny and misshapen children by the Spartans was more humanitarian and, in reality, a thousand times more humane than the pitiful madness of our present time where the most sickly subjects are preserved at any price only to be followed by the breeding of a race from degenerates burdened with disease. No prizes for guessing that these are the words of Adolf Hitler. Seeker, blaming Darwin for observing that “in nature, the fittest survive” is really like blaming the messenger. Shouldn’t you instead be blaming those who use science and religion for “unsavory results” rather than shooting the messenger? blaming Darwin for observing that “in nature, the fittest survive” is really like blaming the messenger. Shouldn’t you instead be blaming those who use science and religion for “unsavory results” rather than shooting the messenger? I think what Darwin added was the idea that by eliminating the less fit, we are not only preserving the strong, but we are helping to ADVANCE the species because beneficial mutations introduce selective advantage. So while the spartans may have known to kill off the weak, Darwin let us know that we could not only help preserve, but advance the species this way. But I am not blaming Darwin, just Darwinism. His interesting idea is bogus, and the point of the article was that the Darwin model does not apply well to other disciplines, so perhaps it is not true for biology either. That’s the whole deal.